Danger need not be your middle name to find an adrenaline fix in Calgary. Whatever your idea of wild may be — defying gravity, redlining, things that go bang — there are many places willing to buck your adventurous side in the city. Here are a few experiences sure to raise pulses. Channel your inner Ted Nugent and learn how to responsibly operate a wide range of deadly tools at this professional shooting facility. 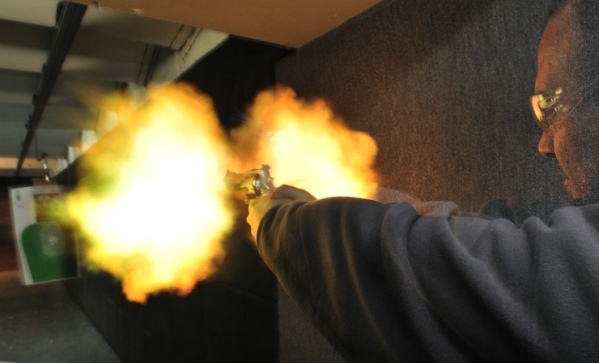 Fully supervised indoor rifle and pistol ranges allow visitors to feel the happiness of a warm AK-47, UZI, Desert Eagle, or 12-gauge shotgun, mere minutes after arriving. If you really get into the gun groove, there are plenty of target shooting groups to join, licenses to train and test for, and loads of lethal weapons to purchase at the Shooting Edge. Racing your ’98 Neon against your buddy’s Ford Taurus may seem like a good idea, and it probably is; unless you’re tearing down residential streets, then you’re just reckless jackasses. Fortunately, Race City’s Secret Street program (currently running each Friday night until mid-October) allows friends to drag race each other, without putting innocent lives in danger. Also, racing pros are on hand to supervise and offer advice, keeping the thrills fully revved and protected. COP boasts North America’s fastest zipline, which can reach speeds of 140 km/h and drops more than 100 metres. It might not sound crazy to you … good. Keep telling yourself that while getting clipped in on the skyscraping platform of COP’s ski jump, and continue to say your not going to slump into the “brace” position as you travel at maddening speeds down 500 meters of cable — most people attempt to slow their roll before reaching the end of the line, will you? If you want the “Albertan Manly Man Bonus” tacked on to your rowdy outing, there’s really no other way to earn the distinction than to climb on the back of an angry bull. The Girletz Rodeo Ranch in Balzac promises to have Bull Riding 101 students sitting on a bull within three hours and riding the mighty beast within a day. And you don’t have to tell your friends that the bulls used for the course are “paddock bulls,” meaning they buck, but not nearly as hard as the animals used in professional rodeo circuits. Image courtesy of The Specializationalist.